These three friends officially formed the band in the summer of 1999 as a prelude to the North American Jew's Harp Festival where they were to perform their unique brand of music that combined electric and/or acoustic guitar with jew's harp, African drums and didjeridu (among many other instruments). Their CD "We're Allowed" has received rave reviews within the oddish genre. They enjoy rubbing elbows with other musicians and sharing their odd-sounds with their peers. You never know where an OddTone may show up! The ODDTONES are available seperately as Session Musicians. If you need to fill out your performance or recording session with The ODDTONE sound, please contact them. 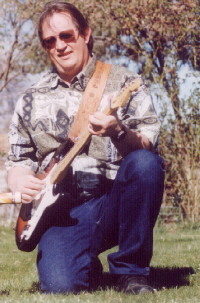 Wayland Harman is a Kansas City, MO native whose interest in music has grown steadily since graduating from high school in Pennsylvania (1976). His association with the North American Jew's Harp Festival has led him to focus on mouth resonated instruments, in addition to strings and percussion. As the inventor of the Clackamore and developer of the Reeded mouth bow, Wayland's creations come alive in the music of The ODDTONES. 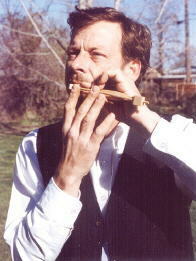 Modern microphone techniques and Wayland's unique performances bring ancient and subtle instruments to the forefront. The amazing sounds of mouth resonated harmonics highlight music that ranges from blues to folk and world beat to classical. The use of a didjeridu as a melodic instrument is, as far as we know, a technique all his own. Ashiko, Djembe & assorted other percussion, Trump (Jew's Harp), Clackamore, Vocals, Odd stuff, Songwriter Mark Poss, is a native of Fostoria, Ohio and has been involved in music since his first stage performance at the tender age of five. His background is that of a percussionist with Jazz, Rock, and Blues influences, as well as being a poet, singer and songwriter. 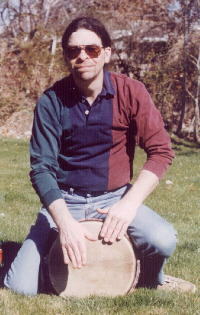 Since moving to Idaho's Treasure Valley in 1988, Mark has had an increased awareness of "World" music and odd instruments. His harmonies, percussion and energy add depth to the unique ODDTONE sound. He now lives in Southern California. Currently Mark is webmaster for the Jew's Harp Guild. 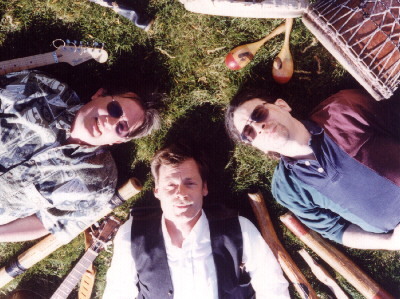 With Wayland Harman and Dan Gossi as partners, he helped form Mouth Music Press in May 1998 to promote and sell mouth-resonated instruments and related items. Mark spends his time on the phone playing instruments for customers and packing up their orders..
Mark loves spontaneous jamming and intricate rhythms, but also enjoys meditative and trance inducing sounds. He has labored at the art of throat-singing and explores the music, and musical history, of different cultures. Acoustic & Electric Guitars, Mandolin, Vocals, Odd stuff, Songwriter Michael Bruesch is a native of Idaho. His interest in music began at birth, or so it seems. His family, friends, and musical peers have introduced him to almost every genre of music that exists. Pressured into attending the North American Jews Harp Festival by his friend Mark Poss, Michael discovered yet another genre of music that he had not explored. He was mesmerized by the trance-like and meditative qualities of the spontaneous jams occurring on the oddest instruments he had ever seen. Jews harps he had seen and heard before - indeed his grandfather had played one - Bluegrass, Folk, and American standards had always used them. But mix them with mouthbows, African drums, clackamores, didjeridu, nose flutes and other unusual instruments, and there is this sound that is - indescribable. THEN - the big idea occurred - "If I could get these guys to recreate this sound against a foundation that was a little more popular - like classic rock or blues (also more my style) we could spoon feed this new sound to a whole world audience, using my original songs, we might actually have a product we could sell." NOW - guitarists and in particular electric guitarists are not well received at the Jews harp festival because they drown out the Jews harps - Michael's work was cut out for him - mostly uphill - dragging people along - just like he had been dragged into the Jews harp festival. MELDING- is the answer. If you can't convince someone that you're right - compromise Three individuals coming to an intersection from three different directions produce a large CRUNCH, or they meld into something odd. And that is what is happening - The ODDTONES - an oddity - an odd-a-tious odd-i-tory experience!